Comedy and magic is an irresistible combination. And no one but Magic Manas aka Manas Tayal is gifted with this combination. Magic Manas is an internationally renowned expert sleight of hand artist who blends magic and comedy in a unique and entertaining way, to not only amaze the audience but to have a show that everyone will remember for quite a long time. He has worked in some of the hottest venues in the world. He has been performing across the globe, including on cruise ships from the USA and Australia. 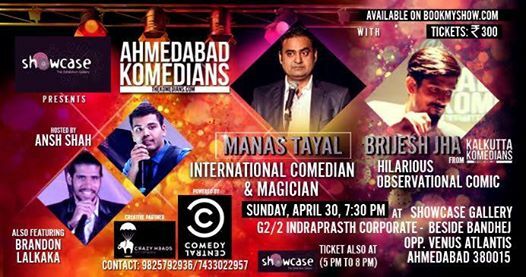 Brijesh is a hilarious observational comic who will have you rolling on the floor with laughter. Bring your own carpet.